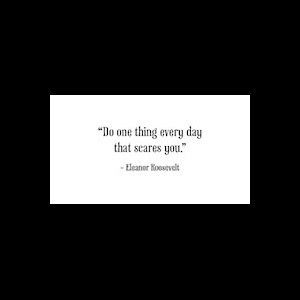 Eleanor Roosevelt’s famous quote reminds us to “do one thing everyday that scares you.” We all have different thresholds for fear, and different ways we process our fear. Overcoming fear also has a different meaning for each of us. But fear can be paralyzing. Inc. Columnist Geoffrey James wrote an interesting article about tricking yourself out of fear and into action. The idea is that we get the best results when we take big leaps. They may be one of the scariest times, and full of risk, but the outcome, one way or the other, is most rewarding. Think about some of the biggest decisions you’ve made in your life; things that disrupted your status quo. I’d be willing to bet, even if the planned outcome wasn’t achieved, it opened other doors to new opportunities. Don’t cling to your comfort zone. People stay in jobs, in towns, and in relationships in which they are unhappy because it is easier than taking a risk and making a move to change things. James says to make the conscious decision to live your life the way you want, and make decisions based on that intention. Don’t let irrational fears hold you back. Be honest with yourself and ask what exactly you are afraid of. Break it down into scenarios and “what ifs.” You will more than likely find each worry can easily be overcome. Create alternatives and fall back plans for each scenario giving you that safety net should things not go as planned. Make fear a call to action. This will resonate for those who appreciate a good challenge. Make the fear your kick in the pants, and get it done today. Simple as that – stop thinking about it and just do it. Get excited about the action you fear. Go back to those decisions or situations I asked you to think about at the beginning of this post. In retrospect, it was likely a source of excitement once completed; it might have been quitting a job, starting a business, running a marathon, or climbing a mountain. It might have been as simple as making a phone call or having a confrontation with a boss or employee. It’s scary and nerve-wracking beforehand, but afterwards, it usually feels exhilarating. Latch on to that; the excitement of doing something scary. I’d love to hear from you, now. What have you done lately to overcome fear? Photo courtesy of Vale Design.